Over 35,000 people have taken part in James Knight's IMA Style behavioural survey questionnaire in the past four months, and this number is increasing by over 1000 per week. Each participant has identified 1of 4 styles as being his/her dominant pattern of behaviour called the IMA Style. When you know a person's IMA Style, you know that person's needs and wants, strengths and weaknesses, how he/she likes to give and receive information, what motivates her/him, how she/he thinks, and how to assure her/his satisfaction. People give away visual verbal and vocal clues that indicate his/her IMA Style. James Knight,the creator of IMA Personality Profiling will show you how to Identify each IMA Colour Style along with Strategies that give you and your company Customer Insight. You will be shown how the fast, simple and inexpensive IMA Profiling System can build loyalty and increase sales,simply by treating people the way they want to be treated. 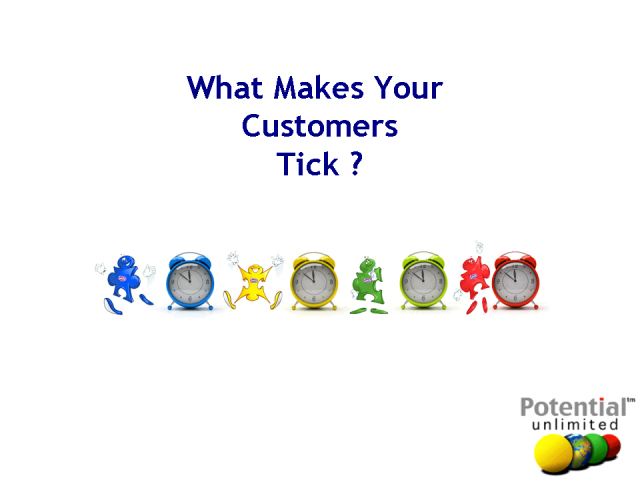 Title: What Makes Your Customers Tick?